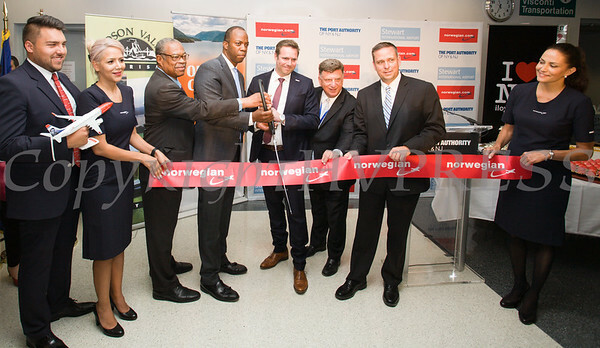 A ribbon cutting was held to celebrate the launch of Norwegian’s first scheduled international service from Stewart International Airport on June 15, 2017. Markly Wilson, Empire State Development/ I LOVE NEW YORK, Huntley Lawrence, Director of The Port Authority of New York and New Jersey’s Aviation Department, Thomas Ramdahl, Chief Commercial Officer, Norwegian Air, Ed Harrison, Port Authority of NY and NJ, General Manager, Stewart International Airport, and Steve Neuhaus, County Executive of Orange County, surrounded by Norwegian flight crew, cut the ribbon to celebrate the launch of Norwegian’s first scheduled international service from Stewart International Airport on June 15, 2017. Hudson Valley Press/CHUCK STEWART, JR.